Right from the release of Android 7.0 Nougat OS, we have been witnessing some Custom ROM in play, Many devices that are yet to receive its updates of Android 7.0 Nougat ROM have already gotten its AOSP ROM and i believe the users of this smartphone are actually enjoying the fascinating features of Android 7.0 Nougat. You might be surprised as why many Smartphone users are eager to lay their hands on the Android 7.0 Nougat, believe you won't know till you check out this amazing features of Android 7.0 Nougat. Xiaomi Mi 3 and Mi 4 get’s their first unofficial Android 7.0 Nougat AOSP ROM. Here We will be sharing step by step guide to Download & Install Android 7.0 Nougat AOSP ROM On Xiaomi Mi3 and Mi4. Follow the given steps to Update Xiaomi Mi3/Mi4 to Android 7.0 Nougat Via AOSP Custom ROM. Well i know some users are still blind to what AOSP ROM means in relation to the original Updates that comes through OTA. AOSP ROM is an acronym for Android Open Source Project and it actually means an unmodified ROMs or code from Google. AOSP ROM are Customs ROM but the term "Custom ROM" does not mean that its customized ROM in general, it is a term that specifically refers to ROMs that have been customized by third parties i.e. not the Manufacturers or Carriers. since you already know what AOSP ROM means now lets proceed on how to install it on Xiaomi Devices. Xiaomi Mi3 and Mi4 becomes the first Xiaomi devices to get android Nougat 7.0 ROM. There are unofficial Nougat ROMs available for Some Xperia devices, Google Nexus 5, Nexus 6. This is a great news for all Xiaomi Mi3 and Mi4 users who want to experience the latest Android Nougat 7.0 on their devices. 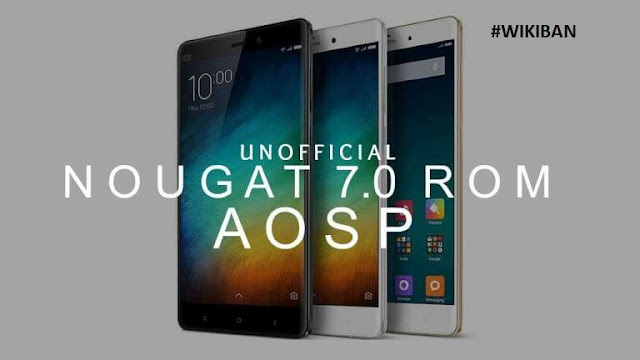 Follow the given steps carefully to Download & Install Android 7.0 Nougat AOSP ROM On Xiaomi Mi3 and Mi4. Very special thanks to XDA developer vasishath for releasing the initial build of Android 7.0 AOSP ROM for Xiaomi Mi3 and Mi4. This method only works on Mi3/Mi4 with TWRP installed on it. So make sure that, your Mi3/Mi4 has TWRP then follow the given guide to Download & Install Android 7.0 Nougat AOSP ROM On Xiaomi Mi3 and Mi4, This will Update Xiaomi Mi3/Mi4 to Android 7.0 Nougat. www.wikiban.com will not be held responsible for any damage occurred to your device in the process of following this tutorial. Do it at your own risk. Make sure there is at least 60% battery left on your smartphone before begin. Now from TWRP Recovery =Take a proper Nandroid backup so that you can restore anytime you need. Now boot your device into recovery mode. Your Xiaomi Mi3/Mi4 should be updated to Android 7.0 Nougat. If you dont want to miss any of our latest update you can subscribe here with your email address or you can follow us on facebook to get the latest updates about tech and more. World of TechnologyFree and Cheap Internet Browsing, Unlimited free mobile contents for mobile phones & PC, Blogging Tips, Online Legitimate Money Making Tutorials, Technology Gist and Many More. ⚠WARNING: Every advert left on comment section of this blog are not endorsed by primesong.com they are scam. on other websites without permission.